Just quickly introducing myself. I am really happy to be in this forum. The great Dave had adviced me on and eventually sold me a beautiful Nighthawk back in September 2014. After three hundred or so emails answering my questions, he assembled the right set up and paired her with a wonderful pre-amp and shipped her all the way to Amsterdam, in the Netherlands. And guess what, I never looked back. a bot over 4 years with my Nighthawk, she has become one of my greatest loves in live. She is still running hot and I cannot get enough of her. 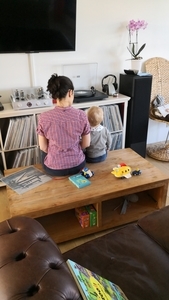 She is playing through my records like there is no tomorrow. I have moved to London and now back to Amsterdam and she has been a loyal companian all the way through. I cannot imagine a live without her. Thanks Dave for everything! Anyone else, let me know if you have questions and if want to know more about why I like her so much! Glad to hear you are still in love with your Nighthawk. She may be the most travelled Nighthawk in Europe/UK right now - having tripped across the channel twice! Let me know if I can ever be of any assistance. What speakers are you using with the Nighthawk? I LOVE this picture actually. Maybe you can tell what speakers they are?